There's more to New England's history than lazy Pilgrims, famous Revolutionary War battles and John F. Kennedy. Seriously folks, there's a lot more. New Englanders of ole were a spirited, stouthearted and -- at times -- crazy bunch, who spent their days evading bloodthirsty pirates, running from massive floods of molasses and engaging mountain lions in hand-to-paw combat. 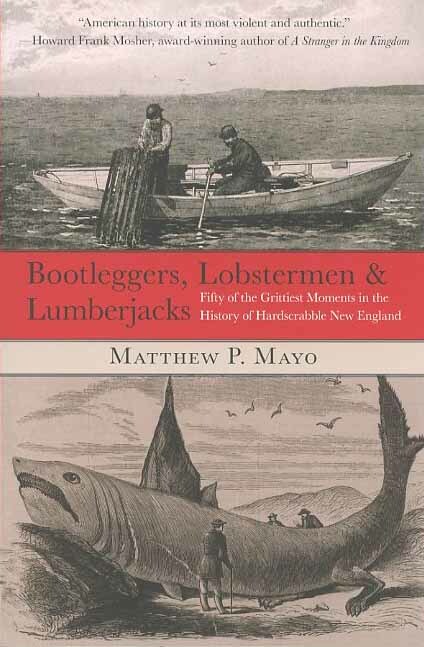 Or at least that's part of the picture Matthew P. Mayo paints in his book, Bootleggers, Lobstermen & Lumberjacks: Fifty of the Grittiest Moments in the History of Hardscrabble New England. Mayo, who spent the first decade of his life in Rhode Island before moving to Vermont's Northeast Kingdom, has succeeded where many traditional grade school textbooks have failed: he's made the history of New England engaging, exciting and -- for those who equate historical study with root canals -- approachable. Instead of laying out a broad narrative that painstakingly documents each decade, Mayo selected 50 moments from New England's past and wrote them up as if each were a short story. Where historical records of conversations were absent, Mayo invented witty, relevant dialogue for adding depth and personality to characters. My favorite story from Bootleggers, Lobstermen & Lumberjacks: "Rocket Ride." It chronicles the fateful journey of two young men who build illegal slideboards (which are essentially old-school luges that operate on tracks) and ride down Mount Washington's Cog Railway. Spoiler alert: the two Granite State daredevils never put breaks on their slideboards and their descent quickly turns into a ride from hell. Thanks so much for the high praise. I'm pleased to hear you've enjoyed the book. I, too, am an inveterate New Englander, and this book was a blast to write. In addition to novels and Western non-fiction, with my photographer wife I've also written three coffee-table books about northern New England (Maine Icons, Vermont Icons, and New Hampshire Icons), the first of which is out now, the second and third will be released next summer. I also have a couple more books about New England history due in the next year or so. You can find out more about them all (and more) at: www.matthewmayo.com. Thanks again! I'll be sure to link to your post. Thanks for the comment, Matthew. I will definitely be on the lookout for your latest literary offerings. Keep up the great work. You are an inspiration to aspiring New England writers like myself. Let me know if/when you start working on Massachusetts Icons! Cheers!